Get Ahead. Stay Ahead. Summer Advantage. CLASSES ARE FILLING, SO REGISTER NOW. 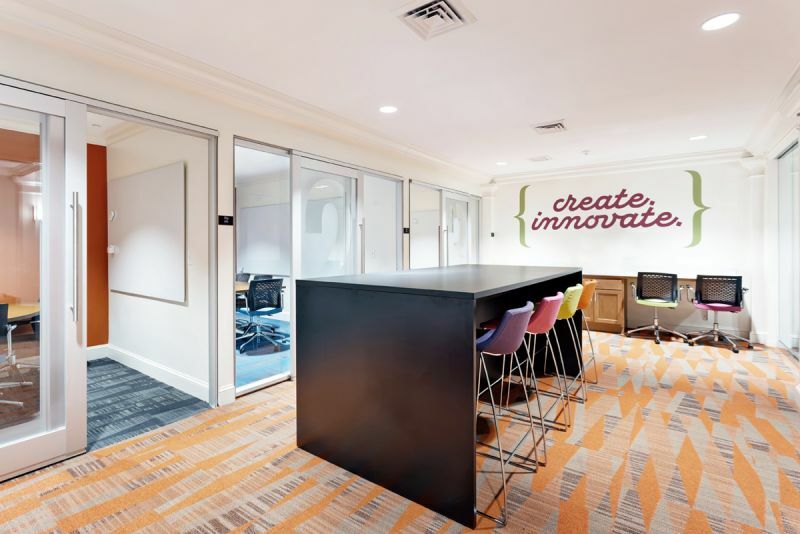 Click here to register for Summer Advantage 2019. You can also make your Summer Advantage deposit, here. You’ve already made the decision to receive an extraordinary education in an inspiring environment with caring people, so why wait until August to get started? Summer Advantage, designed specifically for incoming freshmen, lets you jump-start your college experience by gaining eight credits toward graduation before freshman year officially starts. 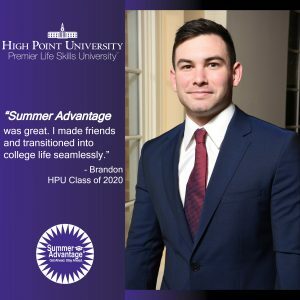 Collaboration is an integral part of High Point University’s liberal arts experience and Summer Advantage will empower you to establish a strong academic foundation while acclimating you to the unparalleled social, recreational and service opportunities available to you at HPU. 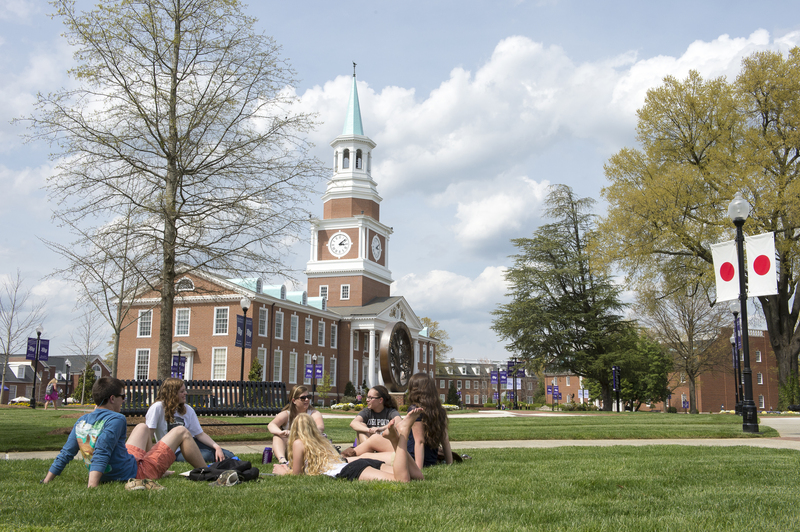 You’ll gain confidence and feel right at home in the HPU community as you network with your peers, Student Success Coach and academic professors. 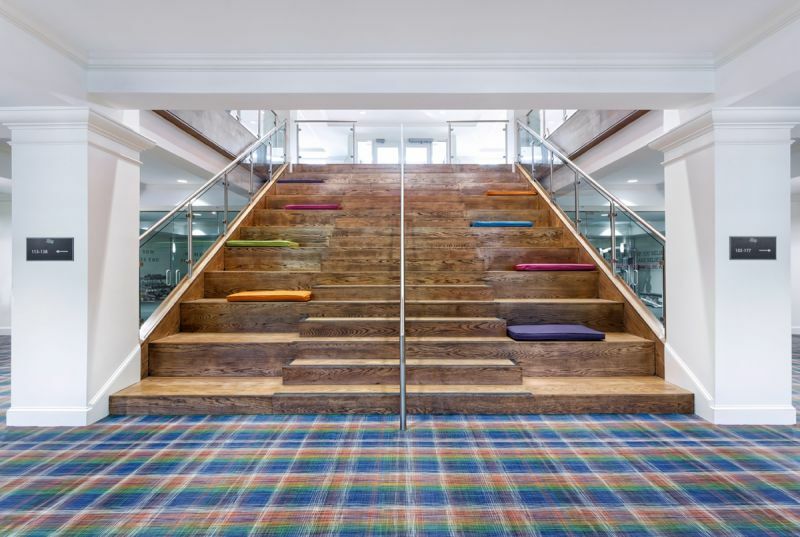 This summer, Summer Advantage students will reside in Caffey Hall, High Point University’s AMAZING new, high-tier residence. Click here for an online tour. Under “Item Information”, you’ll see “Summer Advantage Deposit”. Select Summer 2019, make your deposit and you’re good to go! Move-in for Summer Advantage will be held on Saturday, June 29 from 8:30 am to 12 pm. Lunch will be provided for students and families. The SA2019 student and parent orientation will be from 1:30 pm to 2:15 pm. This concludes the parent portion of Summer Advantage move-in. An exciting evening activity along with dinner is planned for Saturday, June 29th. A more detailed schedule of events for move-in weekend will be provided to students and parents in May 2019. Classes will begin on Monday, July 1st. Students will have exams on Thursday, July 25 and Friday, July 26. Move-out day will also be held on Friday, July 26th once students finish their last final exam that morning. Students will be finished with their exam on that Friday before 12:00 pm. Registration for Summer Advantage is underway, online, right now, right HERE. Your Summer Advantage deposit is due within 10 business days of completing your registration form. You can pay your deposit online through your MyHPU page. This will ensure your participation in the program. Be sure to do both: register AND make your deposit. Be sure to register to let us know you’re coming and which of our Summer Advantage courses you wish to take. Then, confirm your registration with your $500 deposit. The comprehensive cost and financial investment for SA2019 is $8,750 and includes tuition, room, meal plan, NC Tax and all other expenses, excluding textbooks and personal items. The North Carolina tax of 6.75% for the meal plan is $63.32. Advancement. Students are able to earn eight credit hours towards graduation. This puts your student ahead of peers in the Freshman class when registering for classes, choosing a dorm and more. 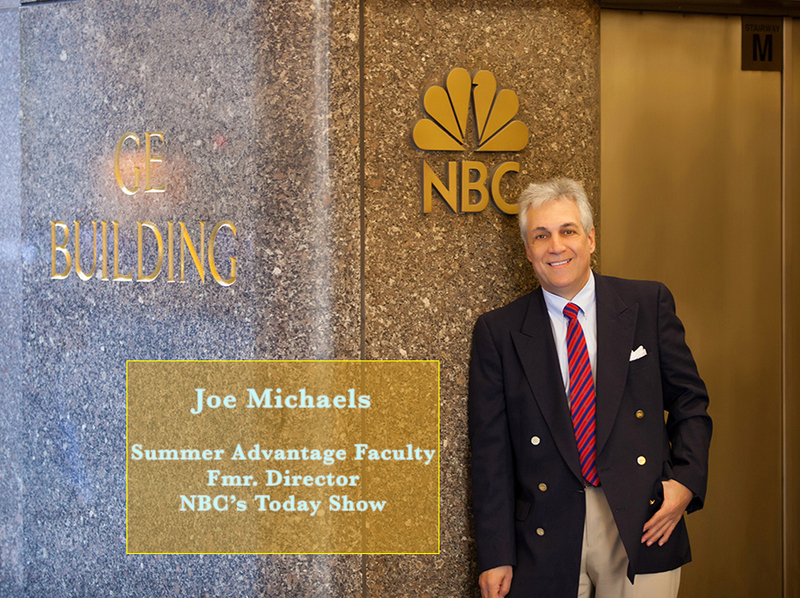 And, if your young scholar wants to double major, minor, and/or pursue a pre-professional track, Summer Advantage will really accelerate their success. Friendships. Students are able to start forming new friendships and collaborations inside and outside the classroom. Through classroom interactions, Lunch & Learns and weekend venture trips, students are able to strengthen and expand their support network while also enjoying the collegiate learning experience. Confidence. 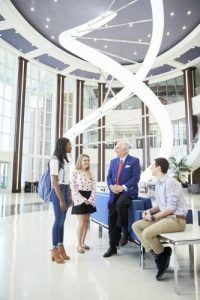 Students will have the opportunity to get a jump-start on connecting with faculty, as this can lead to opportunities for research and further collaboration in the future. For students who are Undeclared, attending Summer Advantage will allow them to meet with a Career Advisor earlier in their exploration process in order to learn more about potential career paths that interest them. Success. Students will connect with their Student Success Coach through formal meetings and informal activities to map out a plan for academic success and campus involvement. Students will also learn more about the academic support resources provided on campus. Maturity and personal growth. Students will start the transformation from a high school student to a collegiate scholar— students who have attended Summer Advantage in the past have indicated tremendous personal growth throughout this month on campus before their initial fall semester. Students learn and experience the expectations of independent college life, familiarize themselves with campus resources, and return in August with an increased sense of confidence for college success. Option 1 includes taking two 4-credit courses which will fulfill general education requirements (graduation requirements). 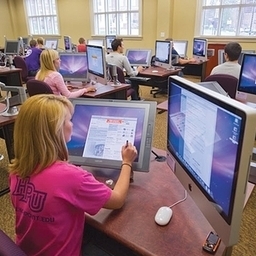 Option 2 includes taking one 4-credit course that will fulfill a general education requirement, one 3-credit study skills course (ADV 1101; an elective course), and one 1-credit physical education course (a general education requirement) or EXP 1401 (an exploration in choosing a major at High Point University). Students will identify their preferences and course options on the SA2019 registration form. Student Success Coaches will share schedules with students the first week of June 2019. ART 2090 Introduction to Ceramics This is a basic course in ceramics with an emphasis in hand-built forms. The methods of pinch, slab, coil, and hump will be used to familiarize the students with clay and clay building. Students will learn the language and terminology used in ceramics. Through various projects students will gain confidence with observational analysis; technical, interpretive, and inventive skills; self-expression; and personal interests. Students will learn the stages of clay from its origin in the ground through the firing and glazing stages. Group and individual critiques will be included in the course to increase awareness, questioning, and self-evaluation. Through research, the student will demonstrate an awareness of an appreciation for the works of ceramic artists from our culture and other cultures. The student will develop knowledge about the early history of ceramics. Four credits. Satisfies the Performing/Visual Arts General Education Requirement. FYS 1000 Do You See What I See? 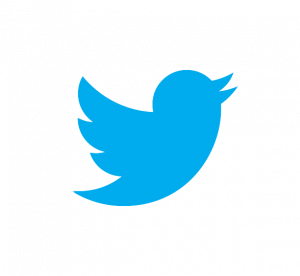 Semiotics and Society (Section 02). Semiotics, the study of signs and sign systems extends the notion of text beyond the written page to any artifact that can “stand for” something else—not only pictures, sounds, gestures, and body language, but also objects and even the spaces between them! Signs and sign systems are the basis of the intentional codes that create cultural meanings, so in this sense, the course researches the ways we practice communication. Semiotics is therefore the study of making meaning (both “encoding” and “decoding”) in its widest possible sense. 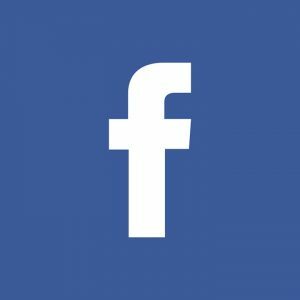 It is concerned with the description of sign systems and the codes (“rules” and conventions) that structure meaning, as well as the particular instances or events in which signs are constructed. In this course, we will focus on the work of semioticians in the areas of myth, photography, film, television, and subculture and consider how semiotic concepts and methods can be used to analyze a variety of cultural products, from fashion to television to news to literature. Four credits. Satisfies the First Year Seminar General Education Requirement. FYS 1000 The Real World? Images of Leadership in Contemporary Media (Section 03)— Images of leaders in contemporary media are often a betrayal to real world expectations and requirements for today’s emerging professionals. This seminar will explore the modern presentation of leaders in the media, investigate the implications of those images, and debate the consequences of generational perspectives on leading others in real world settings. Select television episodes and contemporary films will be viewed through an investigative and deliberative framework of leader portrayal and association. Readings on modern leadership, contemporary management expectations, generational differences in the workplace, diversity, and interpersonal communication approaches will be completed. Course requirements will also include class discussions, reflective essays, structured off-campus observations and interviews, a group project, and a final paper/presentation utilizing evidence gathered from television and film as the basis for student research. Four credits. Satisfies the First Year Seminar General Education Requirement. FYS 1000 Talking About Freedom— Using the story of race in America, this course examines the theory of Popular Constitutionalism, or the idea that citizens working outside the courts shape constitutional law and consider how social movements and political mobilizations give rise to new meanings for and expression of constitutional values. Key moments in the struggle for freedom, civil rights and equality created important junctures in the history of constitutional law and show that a wide range of social actors drive change by participating in America’s unique and dynamic constitutional culture. In the long view of history, it’s not the judges, but the people, who decide what their Constitution means. 4 credits. Satisfies the First Year Seminar General Education Requirement. HST 1201 American Beginnings to 1800 This course is a survey of Native American contact with Europeans, cultural interactions in the seventeenth and eighteenth centuries, and the Revolution that created the United States. Four credits. Satisfies the History General Education Requirement. MTH 1110 Topics in Contemporary Math – Illustrations of contemporary uses of mathematics, varying from semester to semester, frequently including topics from: graph theory, theory of apportionment, voting theory and methods, counting methods, probability, personal finance, and game theory. Four credits. Satisfies Quantitative Reasoning General Education Requirement; based on math placement/major. PEC 1021 Aerobic/Fitness Walking This course is designed to teach students the fundamentals of aerobic/fitness walking. Students will learn to improve cardiovascular fitness by participating in a walking program and promoting walking as a potential lifetime activity. One credit. Satisfies PEC Activity General Education Requirement. This course is paired with ADV 1101. PEC 1071 Yoga I This course is designed to teach students the basic discipline of yoga, which includes, the proper breather, relaxation techniques and correct body positions. Students will learn to demonstrate yoga and develop a “vinyasa” or “flow” to their practice. One credit. Satisfies PEC Activity General Education Requirement. This course is paired with ADV 1101. PEC 1311 Weight Training I This course is designed to teach students to use progressive resistance exercises as a means for body toning, and general strength development. Students will learn how to setup a workout program using weight machines and free weights. One credit. Satisfies PEC Activity General Education Requirement. This course is paired with ADV 1101. REL 1001 Old Testament Studies – A course examining the history and religious perspective of ancient Israel as revealed through the text of the Hebrew Bible and pertinent Near Eastern texts. The focus of study is upon the context of the Old Testament in light of its historical background, as revealed through modern critical research, literary, and historical methods. Four credits. Satisfies the Religion General Education Requirement. THE 1200 Fundamentals of Acting An introduction to Stanislavski-based actor training including studies and exercises designed to develop the student’s abilities to create a character. Students will explore basic improvisation, stage movement, monologue, scene work, and script analysis as tools for characterization. Four credits. Satisfies the Performing/Visual Arts General Education Requirement. ART 2090 Introduction to Ceramics – This is a basic course in ceramics with an emphasis in hand-built forms. The methods of pinch, slab, coil, and hump will be used to familiarize the students with clay and clay building. Students will learn the language and terminology used in ceramics. Through various projects students will gain confidence with observational analysis; technical, interpretive, and inventive skills; self-expression; and personal interests. Students will learn the stages of clay from its origin in the ground through the firing and glazing stages. Group and individual critiques will be included in the course to increase awareness, questioning, and self-evaluation. Through research, the student will demonstrate an awareness of an appreciation for the works of ceramic artists from our culture and other cultures. The student will develop knowledge about the early history of ceramics. Four credits. Satisfies the Performing/Visual Arts General Education Requirement. EXP 1401 Exploring Your Major and Career Path Not sure of your major? It’s ok. You’re not alone. Each year, hundreds of High Point University students begin classes without having decided on a major. And even those who have often change their major. This course will empower you to make a quality decision about your major, based on your individual goals and interests. EXP 1401 provides students with the opportunity to explore various career opportunities and decision-making strategies, which will assist them in their personal, academic, and professional development as well as career-related goal-setting. Particular emphasis is placed on developing awareness of self in a professional environment. One credit. This course is paired with ADV 1101. FYS 1000 Do You See What I See? Semiotics and Society Semiotics, the study of signs and sign systems extends the notion of text beyond the written page to any artifact that can “stand for” something else—not only pictures, sounds, gestures, and body language, but also objects and even the spaces between them! Signs and sign systems are the basis of the intentional codes that create cultural meanings, so in this sense, the course researches the ways we practice communication. Semiotics is therefore the study of making meaning (both “encoding” and “decoding”) in its widest possible sense. It is concerned with the description of sign systems and the codes (“rules” and conventions) that structure meaning, as well as the particular instances or events in which signs are constructed. In this course, we will focus on the work of semioticians in the areas of myth, photography, film, television, and subculture and consider how semiotic concepts and methods can be used to analyze a variety of cultural products, from fashion to television to news to literature. Four credits. Satisfies the First Year Seminar General Education Requirement. FYS 1000 The Real World? Images of Leadership in Contemporary Media Images of leaders in contemporary media are often a betrayal to real world expectations and requirements for today’s emerging professionals. This seminar will explore the modern presentation of leaders in the media, investigate the implications of those images, and debate the consequences of generational perspectives on leading others in real world settings. Select television episodes and contemporary films will be viewed through an investigative and deliberative framework of leader portrayal and association. Readings on modern leadership, contemporary management expectations, generational differences in the workplace, diversity, and interpersonal communication approaches will be completed. Course requirements will also include class discussions, reflective essays, structured off-campus observations and interviews, a group project, and a final paper/presentation utilizing evidence gathered from television and film as the basis for student research. Four credits. Satisfies the First Year Seminar General Education Requirement. HST 2202 American Moments – A course focused on particular years of decades in American history, studying decisive events, people, and changes in the context of broader themes in the United States. The course will focus on the chronological moment and its legacy in historical and popular memory. Selection of chronological moments will vary with the assigned instructors for the sections of the course. Four credits. Satisfies the History General Education Requirement. This summer’s HST 2202 topic: The Salem witchcraft trials are notorious in American history, representing a seemingly irrational moment in early America when Puritan superstitions and disdain for deviance produced accusations, prosecutions, and killings of many innocents. Because of the event, the Puritans have a historical reputation as uptight hypocrites, and the term “witch hunt” condemns the referent as an absurd pursuit of phantom evils. We will explore the witchcraft trials, their background and context, and their legacy in American history, and we’ll discover even more implications of the events and the term. Several case studies and a host of trial records await our consideration. PEC 1032 Cardio Kettlebell. The purpose of this class is to provide students with the fundamentals of exercise with a kettlebell. Students will learn cardio fitness and strength training through the different movements of the kettlebell swing. Students will also learn how to create their own kettlebell workout routine. One credit. Satisfies PEC Activity General Education Requirement. This course is paired with ADV 1101. PEC 1071 Yoga I –This course is designed to teach students the basic discipline of yoga, which includes, the proper breather, relaxation techniques and correct body positions. Students will learn to demonstrate yoga and develop a “vinyasa” or “flow” to their practice. One credit. Satisfies PEC Activity General Education Requirement. This course is paired with ADV 1101. PEC 1152 Basketball – This course is designed to teach students a general knowledge of basketball. Students will learn the principles, techniques, safe practices, strategies and sportsmanship of basketball along with improve their skills and general physical fitness. One credit. Satisfies PEC Activity General Education Requirement. This course is paired with ADV 1101. REL 1003 Sacred Experiences in World Religions – This course will explore the phenomenon of religion as found within numerous historical and cultural contexts. Although no single religious tradition will be treated comprehensively, materials from the following traditions will be selected in order to better examine the thematic issues that animate the religious dimension of the human experience: Judaism, Christianity, Islam, Hinduism, Shinto, Jainism, Buddhism, and Confucianism.. Four credits. Satisfies the Religion General Education Requirement. THE 1200 Fundamentals of Acting – An introduction to Stanislavski-based actor training including studies and exercises designed to develop the student’s abilities to create a character. Students will explore basic improvisation, stage movement, monologue, scene work, and script analysis as tools for characterization. Four credits. Satisfies the Performing/Visual Arts General Education Requirement. ADV 1101 Foundations for Academic Success – An academic and life skills course designed to help create greater success and to provide an opportunity to learn and to adopt methods to promote success in college course work, careers, relationships, and life in general. Students will learn how to read college textbooks with special emphasis on improving reading comprehension and ability and application to other reading. 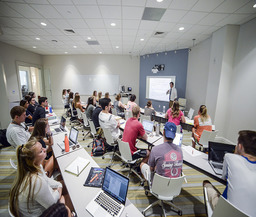 Students will also learn to improve comprehension and note taking skills and apply other learning techniques relating to learning styles, processing information, managing time effectively, setting goals, increasing concentration, reducing stress and procrastination, improving listening skills, preparing for test, and performing well on tests with a variety of question formations. Three credits. Will not satisfy a General Education Requirement. Elective credit course that is appropriate for students who desire additional assistance with study skills. This course is required for conditionally admitted students and students in the Learning Excellence program and is paired with a PEC class or EXP 1401. 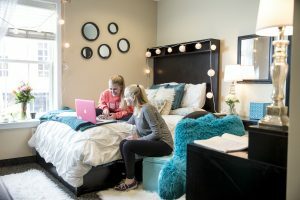 Summer Advantage students are required to live on campus. 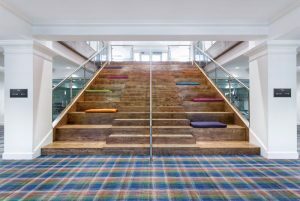 All students are housed in the same residence hall (Caffey Hall, our newest, higher-tier residence), creating a strong sense of community and fellowship. Move-in for Summer Advantage 2019 is Saturday, June 29 from 8:30 am to 1:00 pm. Lunch will be provided for students and families. The SA2019 student and parent orientations will follow, typically from 1:30 pm to 2:15 pm- this will conclude the parent portion of Summer Advantage move-in. All times are EDT. Registration for Summer Advantage 2019 is on NOW! 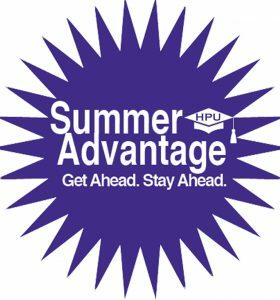 High Point University's unique advancement program for incoming freshmen, Summer Advantage helps you Get Ahead and Stay ahead, with up to 8 credits before Fall semester begins. It really is a must-do at HPU! 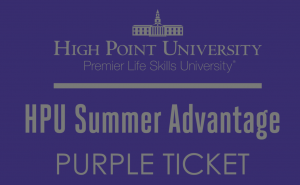 To learn more, visit www.HighPoint.edu/SummerAdvantage.